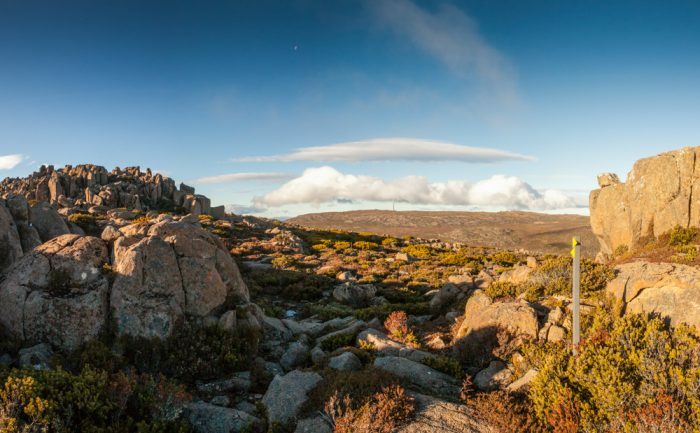 The Mount Montagu track offers a unique opportunity for hikers to explore the alpine sections of Wellington Park while being rewarded with panoramic views of Mount Wellington and the Huon Valley. 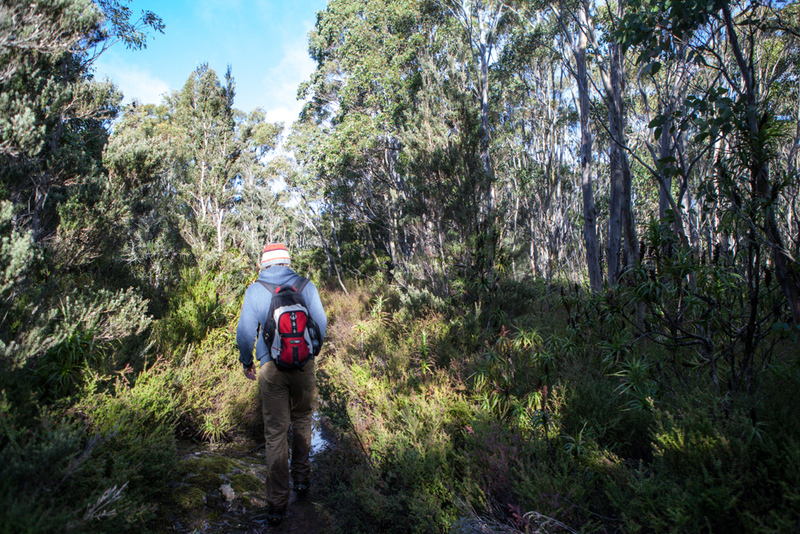 Crossing many different terrains, this 6 hour, 12km return hike is a challenging and rewarding walk for experienced hikers. 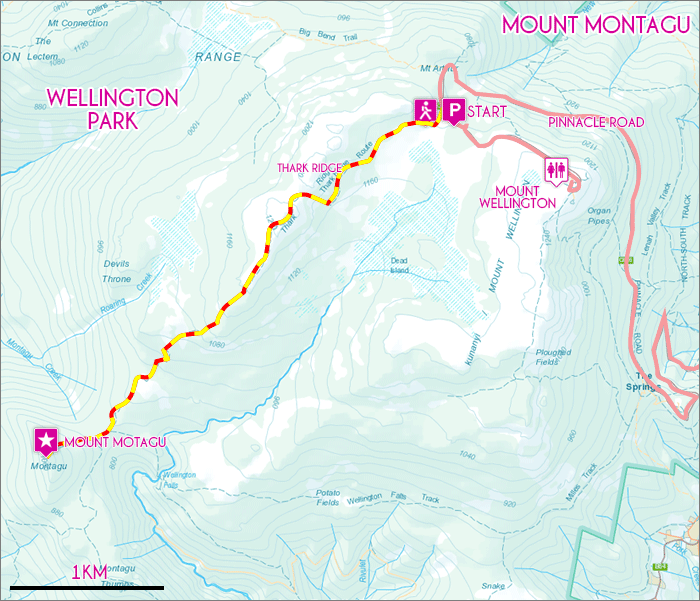 The following guide accesses Mount Montagu from the Big Bend carpark just below the summit of Mount Wellington / Kunanyi. This trail includes sections of alpine walking and should only be attempted in clear weather. In poor weather allow more time and inform someone of your hiking intentions. From the Big Bend carpark cross the road to find the signposted start of the Mount Montagu trail. As soon as you step foot onto the track you are greeted by gorgeous white snow guns standing resiliently in their dolerite beds. The trail for this initial section is easily followed as you walk south-west towards Thark Ridge. The trail skirts along the southern side of Thark Ridge, across muddy and rocky sections before eventually climbing to meet and follow the ridgeline. From here you are guided by distinct carins and yellow track markers. In good weather, these are easy to follow. However, as most markers are close to ground level, navigation in snowy conditions soon becomes incredibly difficult. From the ridge sweeping alpine views are offered in all directions and walking is quite pleasant through the inviting boulders. For the next few kilometres you walk gently downhill past a series of mountain tarns. Eventually, Mount Montagu followed by Cathedral Rock comes into view in the distance. Soon the trail descends onto an overgrown fire trail which is followed for 20 minutes before the carin marked turn off to Mount Mountagu is found. Although poorly marked and in failing condition, the ascent comfortably managed by experienced walkers. Once on top, a trig point marks the end of the track. From here your efforts are rewarded by attractive 360 degree views taking in Wellington Park and the Huon Valley. Taking slightly longer on the return, the same trail is followed in the opposite direction back to the Big Bend Carpark.